Observation - Markhamia lutea-Funchal, Madeira - Global. Description: Beautiful tree in the Bignoniaceae family, from Africa.Planted as a street tree in Funchal.Known also under the synonym of Dolichandrone platycalx.Gorgeous tree! 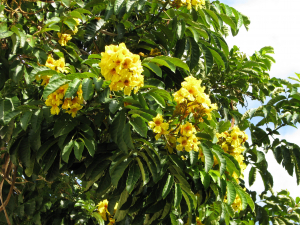 Beautiful tree in the Bignoniaceae family, from Africa.Planted as a street tree in Funchal.Known also under the synonym of Dolichandrone platycalx.Gorgeous tree!